Cecilia wants to do the right thing, but right for who? If she protects her family by staying silent, the truth will worm through her heart. 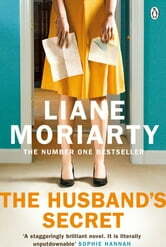 But if she reveals her husband's secret, she will hurt those she loves most . . . If you loved The Husband's Secret, don't miss Liane's new book, Nine Perfect Strangers, available to pre-order now. Excellent story with nice twists and unexpected turns. Nice to be set in Australia for a change! It took a few chapters for me to get into. Wondered how the characters would link. Once I got into the story, several twists and the ending, I was expecting. Tis a good read. A fantastic read, a real toe curler!! It takes a couple of chapters to get you hooked, but boy once you get started its a great story!! I really enjoyed the book.Was surprising. Didn't expect the turning in the story. The finish was really good. Really enjoyed this book, couldn't put it down. Will certainly read more from this author as she is a good storyteller and this novel certainly made me think of what secrets people I 'think' I know are hiding!